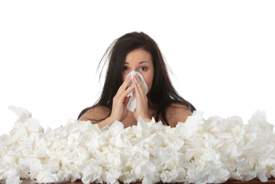 Sneezing, coughing, itchy or watery eyes, and a runny nose are common signs of an allergic reaction. More serious reactions can include constricted air passageways, inflammation, vomiting and even death. Allergies are highly common as it’s estimated that as many as 30% of adults and 40% of children in the United States deal with allergies. Bothersome allergy symptoms are enough to keep you home instead of out enjoying yourself at the park, playing golf, or flying a kite with your kids. While there is a large number of allergens that people suffer from, the most common ones are dander, peanuts, pollen and shellfish. So why is it that not everyone reacts adversely to these allergens? As the master controller of the body, the nervous system runs your immune system, glandular system and every other system that responds improperly to an allergen. Typically, these systems help you respond and adapt to the world around you. But suffering from uncontrollable sneezing and itchy eyes from simply being outside is probably an inappropriate reaction. If your nervous system isn’t working right, you don’t function properly. So, rather than chase the many potential allergens and medications (which often cause drowsiness), we locate and reduce the disturbances we find to your nervous system. While chiropractic doesn’t treat allergies, it aims to restore balance in your nervous system by removing spinal interference. This interference removal helps your body regain its ability to adapt to allergens in your environment and elicit an appropriate response. Dr. Jenna also can also work on clearing the sinuses using several different techniques. If you’ve been plagued by allergies and are tired of masking symptoms with medication, we invite you to try safe, drug-free chiropractic. Contact Paragon Chiropractic & Wellness Center today to book an appointment with Dr. Jenna!